I don't know, the boxes don't bother me, and it didn't take me long to find them on the map. But, the majority are bothered by them, so probably better to change it. I like the colors, and the mountains especially. Very nice. I have to disagree with nolefan, I quite like the bridges. But that's pretty subjective I think, so whatever on that point. All in all, very nice so far. That border is cool, fits very well with the Ethiopia theme. I think you have been here too long cairns. Time for you to move on and get some game play feedback in the main foundry. As always good luck. tkr4lf wrote: I have to disagree with nolefan, I quite like the bridges. But that's pretty subjective I think, so whatever on that point. I haven't posted in this thread yet, lol. But you are right, not sure where that comes from though. I think it stems from Nola_Lifers comment above. Our names are similar. Not a big deal, lol. Oops, meant nola_lifer or whatever. Your names are very similar. WHATEVER!? He is a nole come on now! Game play looks solid. Things are reaaaaallllll slow here. This looks fun. I like that it's a continuation of another map. Here you go cairnswk. A long time coming I know. Looking forward to seeing where you take this. The neutrals for the cities can probably lowered. 5 neutrals on a map this small almost guarantees they will never be taken even as part of the bonus. Is there a reason why N. Afar starts as neutral? Is this for the golden number? If so, I would suggest making it a region with less importance as far as moving across the map...a region like SSW Oromia, SBG, or NBG. As far as the bonuses are concerned, they all look good, but you might think about increasing the bonus for the continent that contains DIre Dawa to a +4 and the continent that contains N. Afar to a +3. As it appears development on this map has stalled (see below), this map is being Moved to the Recycling Bin for the time being. 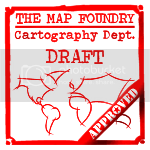 If the mapmaker wants to continue with the map, then one of the Foundry Moderators will be able to help put the thread back into the Foundry system, after an update has been made. I know you're caught up in uni cairns, so once you've updated this one, I will move it back to the MFW. nolefan5311 wrote: As it appears development on this map has stalled (see below), this map is being Moved to the Recycling Bin for the time being. If the mapmaker wants to continue with the map, then one of the Foundry Moderators will be able to help put the thread back into the Foundry system, after an update has been made. NVM, I see what you meant. They've all been changed. Re: Ethiopia: [25.12.12] V05-P4 Gameplay? "Building" on map have been changed. This might make it clearer for some. 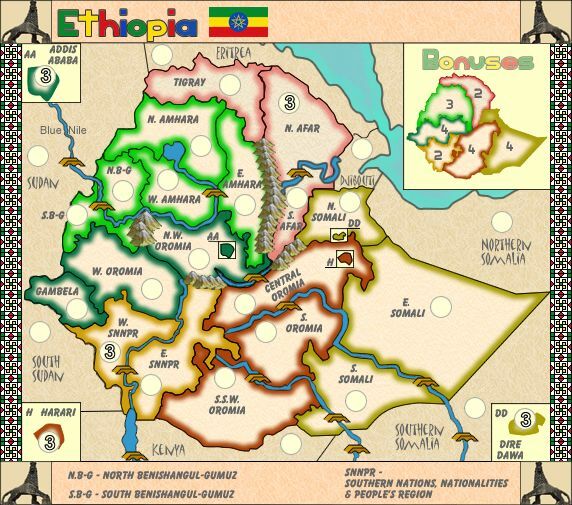 Re: Ethiopia: [25.12.12] V05-P3 Gameplay? nolefan5311 wrote: The neutrals for the cities can probably lowered. 5 neutrals on a map this small almost guarantees they will never be taken even as part of the bonus. Done in V5 for all continents that contain a "building". but N.Afar contintent left at +2....it doesn't contain a "building". Much better what you've done with the buildings. Glad to see this is picking up again. koontz1973 wrote: Moved for you cairns. Any suggestions for this map? cairnswk wrote: Any suggestions for this map? Give me a chance. Got family coming over today so will look at it later for you. all bonuses up for review of course...and all very indicative of the country. 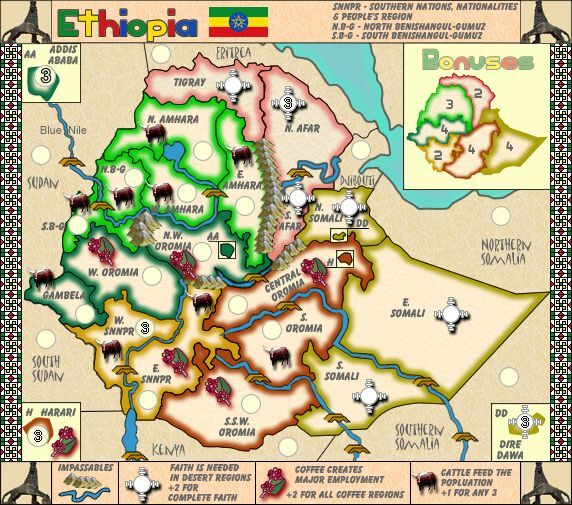 Re: Ethiopia: [27.12.12] V06-P3 Gameplay? Aw, why'd you have to go ruin it like that. Either make it a small-size map or give it a bunch of extra bonuses. x-raider wrote: Aw, why'd you have to go ruin it like that. Well, x-raider, i havn't exactly ruined it...yet! It is reversable if people don't like it. So thanks for you feedback on that. How many extra bonuses were you thinking of it the extras were kept? Well, x-raider, i haven't exactly ruined it...yet! It is reversible if people don't like it. But I can't ask people to support my opinion if I don't voice it now, can I? cairnswk wrote: How many extra bonuses were you thinking of it the extras were kept? I'm talking about the ones you got there already.